Stay in compliance with internal and state regulations that require due dates based on business days, including incorporating custom business holidays. When defining relative due dates to tasks, you can specify whether those dates should be based on business days or plain calendar days. 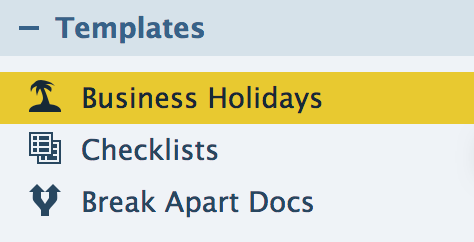 Click [Business Holidays] from the left menu. Business holidays are used to calculate due dates on tasks whenever those tasks are defined using relative date rules. Saturdays and Sundays are automatically considered business holidays. So you don't need to define them here. Fill in the desired Holiday name and date in the fields provided. Save your updates by clicking [Update Business Holidays]. Create a new template by clicking [Add Template] or click the name of an existing template to edit it. Select the [Calendar Icon] next to a task and select whether you want its relative due date to be based on business days or calendar days. When this template is applied to transactions, Pipeline will automatically convert all relative due dates to appropriate calendar dates based on your selection. Go to the transaction and click the [Calendar] icon next to a task. Select whether you want the relative due date to be based on business days or calendar days.